DLSU student Ian Lariba of the DLSU Women’s Table Tennis Team will be a representative of the Philippines in the 2016 Olympic Games to be held in Rio de Janeiro, Brazil. Currently taking up BS in Management of Financial Institutions, Lariba has consistently brought pride to the University in the five years that she has played for the DLSU Paddlers, winning Rookie of the Year in UAAP Season 74, Most Valuable Player in UAAP Season 75, 77, and 78, and being awarded the Athlete of the Year in UAAP Season 77 and Season 78. 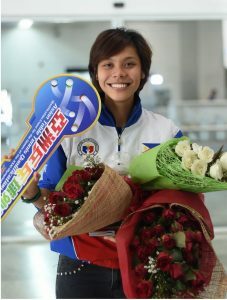 Lariba earned her slot in the quadrennial event after winning in the Asian Olympic Games Qualification Tournament held last April 16 in Hong Kong. She also holds the distinction of being the country’s first table tennis athlete to qualify for the Olympics.